This Melbourne-based Emmett therapist had built a thriving practice out of her base in Yarra Glen and wanted to expand her reach. Emmett is a phenomenal approach to bodywork. Gentle pressure on specific points achieves profound changes in the body; straightening, strengthening, relieving pain and discomfort and releasing restrictions. Gayle treats people and horses and it's the equine side of her business that's she's focussing on expanding. To meet demand, she's travelling throughout Victoria and treating horses and riders on site. 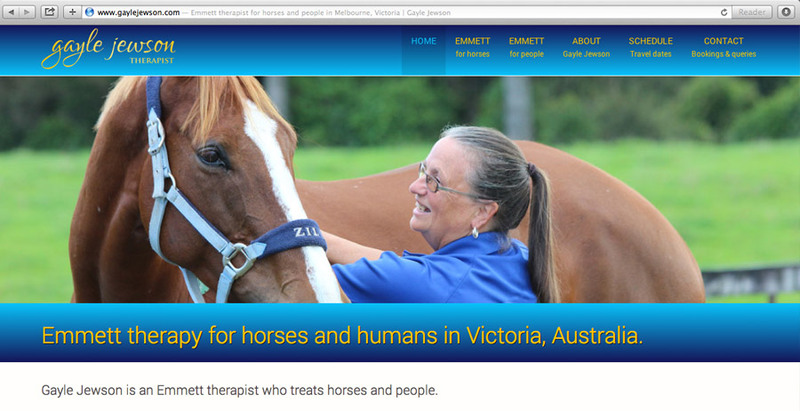 And, she's teaching Emmett therapy for horses throughout Victoria and the Northern Territory. We took a series of photos of Gayle in action and built her a mobile-friendly site complete with travel schedule and booking form so clients can see where she's travelling to and when she's available to treat them and their horses.